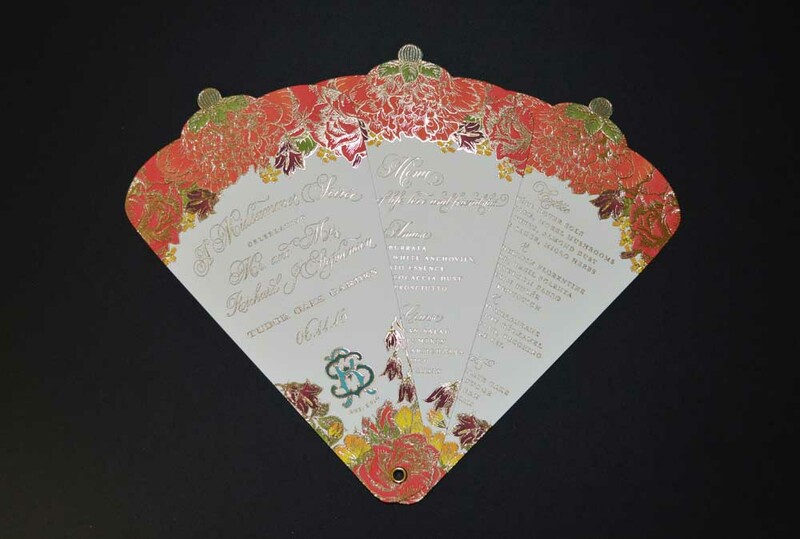 Foil Stamping | AccuColor Plus, Inc.
We have two 12” x 18” auto paper feed foil stamping presses. 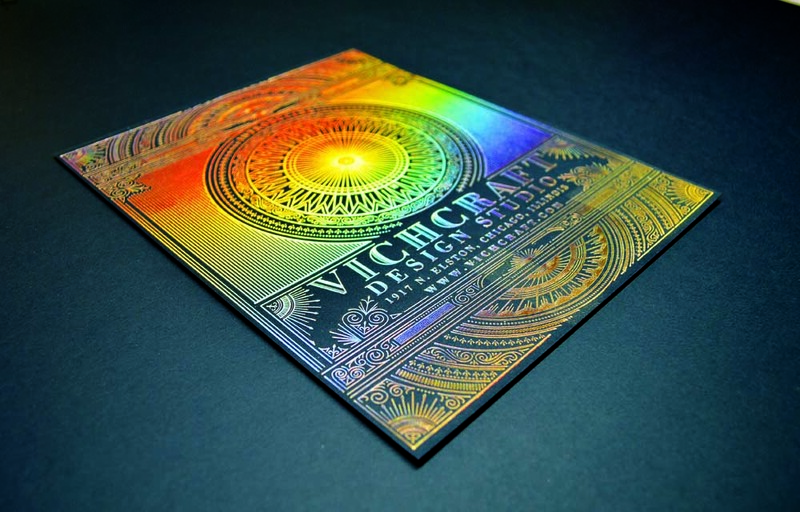 Foil colors can be non-metallic pigments, pearlized colors, satin finished metallic, highly reflective metallic, holographic or dazzling patterns. 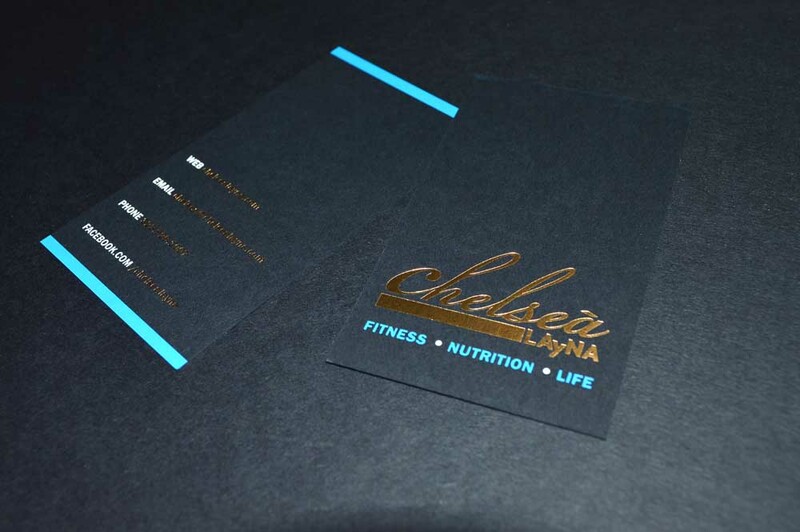 In non-metallic foils, the gloss finish foils perform far better than the matte foils. 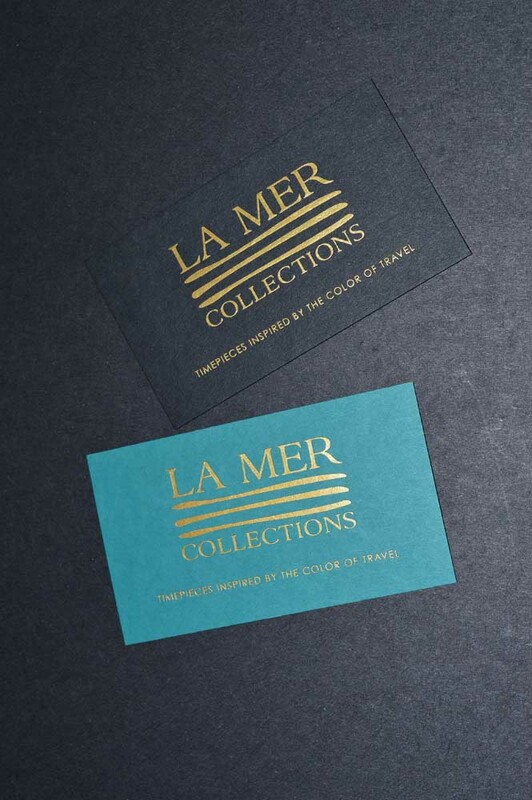 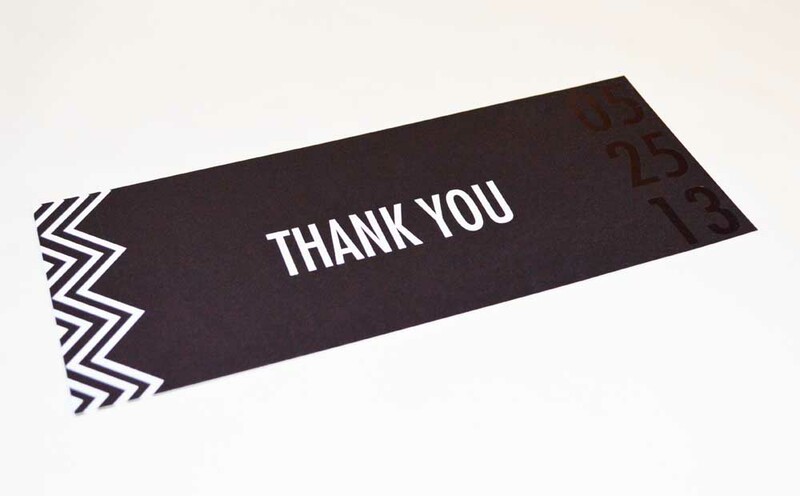 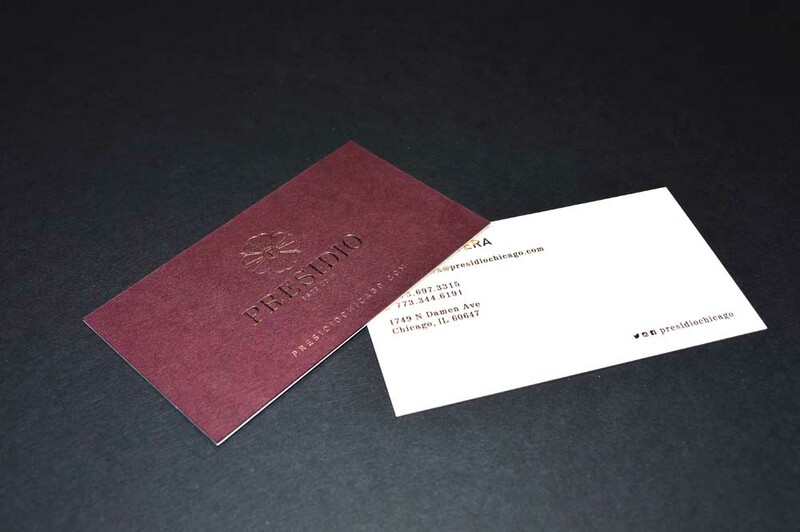 Gloss pigment foils render the sharpest edge of the printed matter. 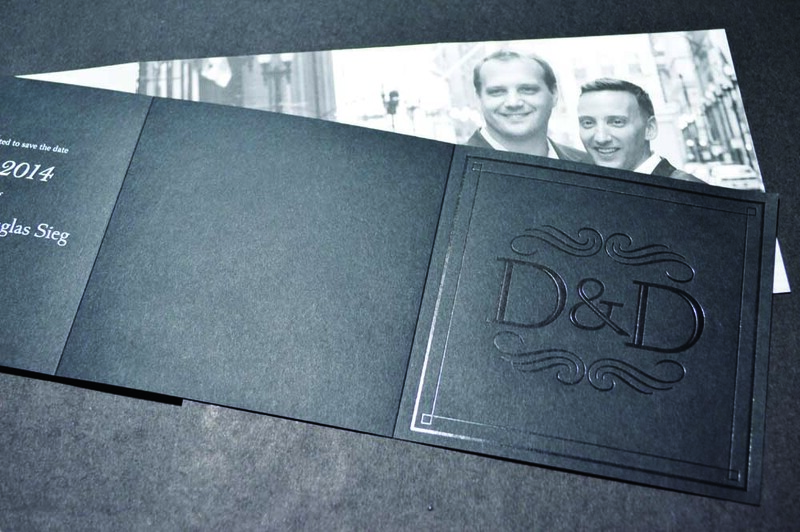 Matte finished pigment foils often have unsharp edges on the printed copy. 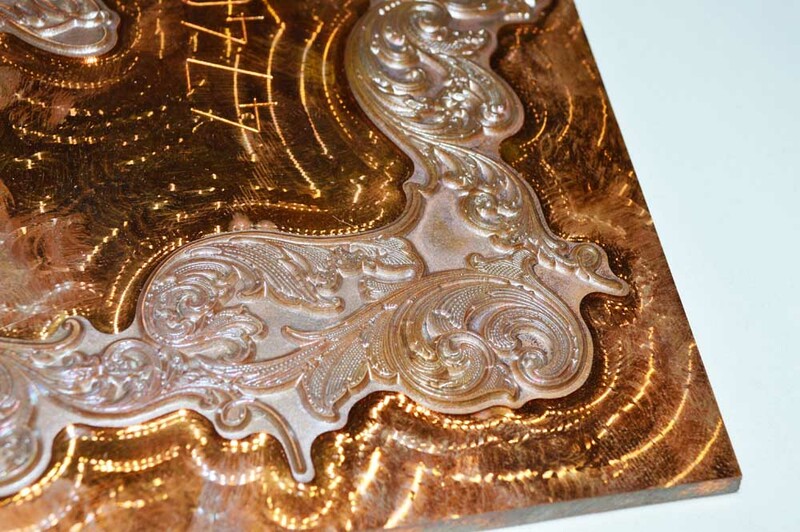 For most work, a gloss finished pigment foil is the best choice. 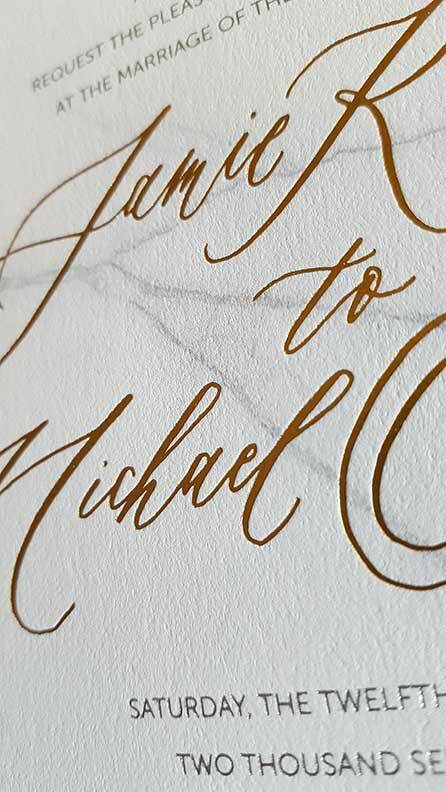 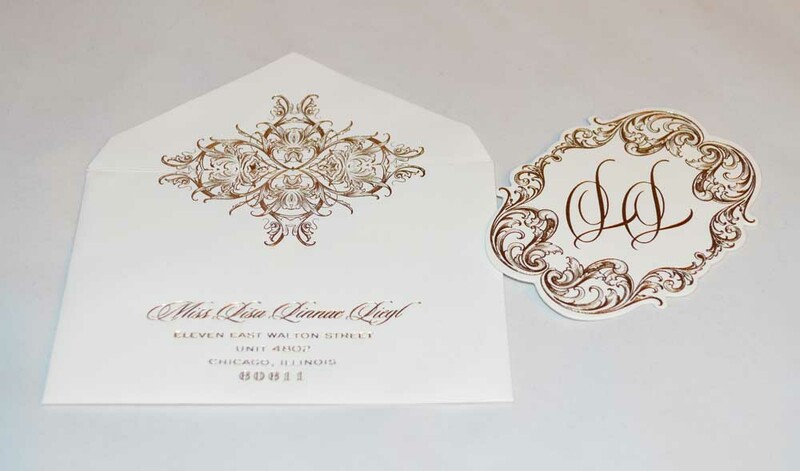 The pearlescent foils will only perform well on light colored papers. 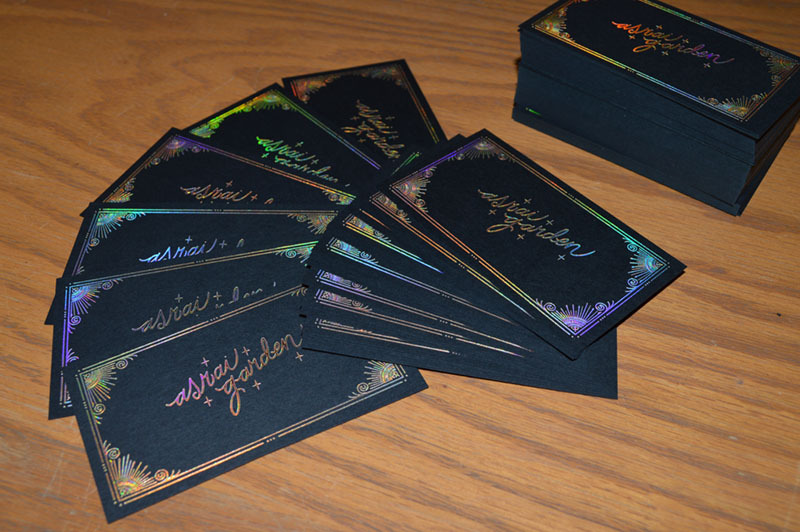 All of the metallic and many of the pigment foils are opaque. 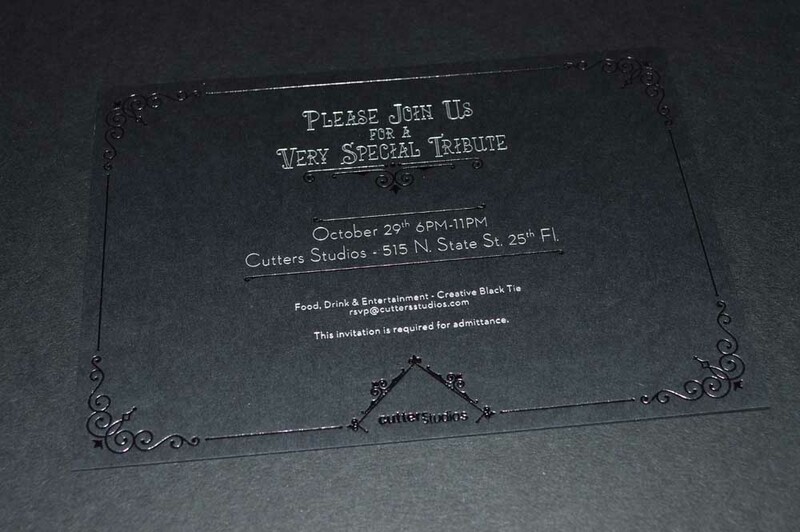 This permits the printing on a dark paper with copy in a lighter color. 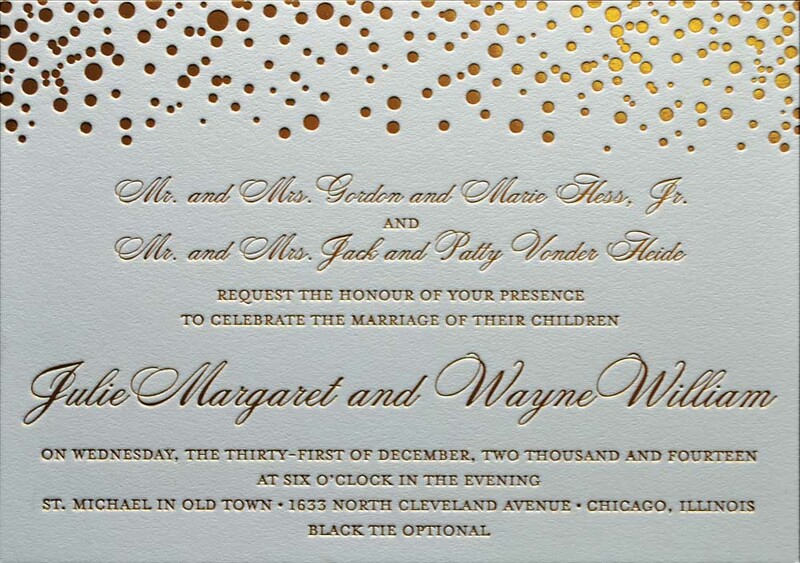 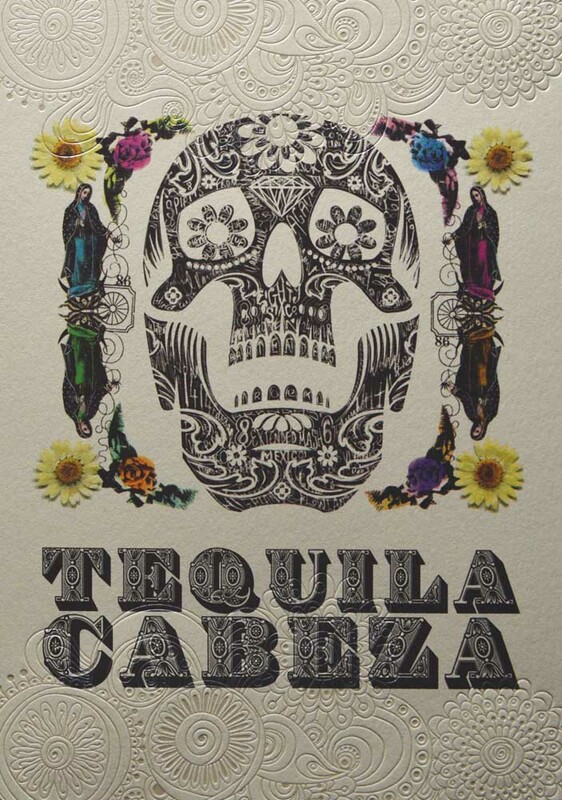 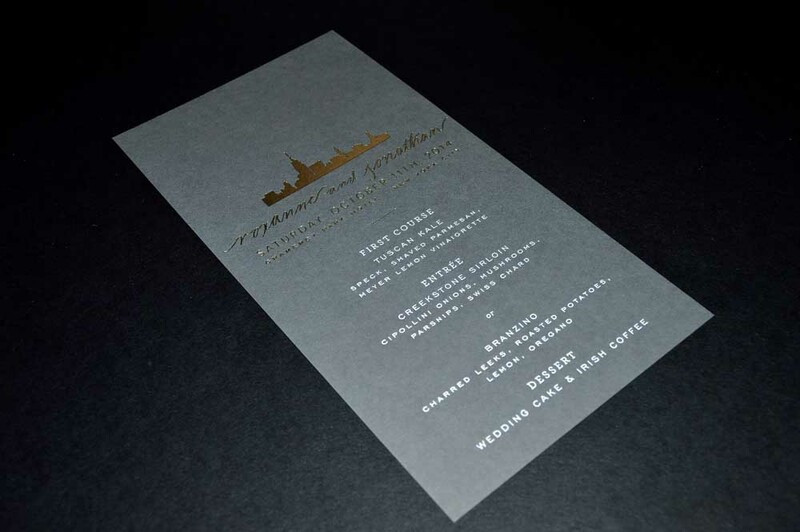 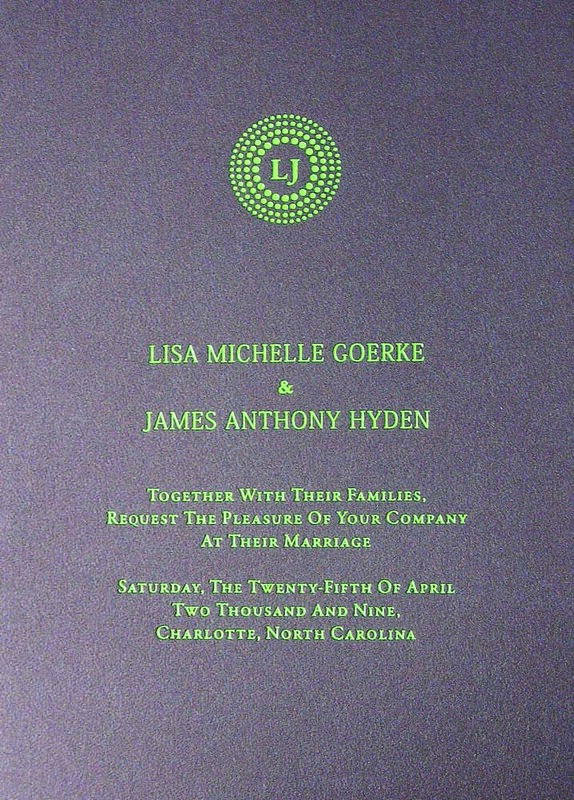 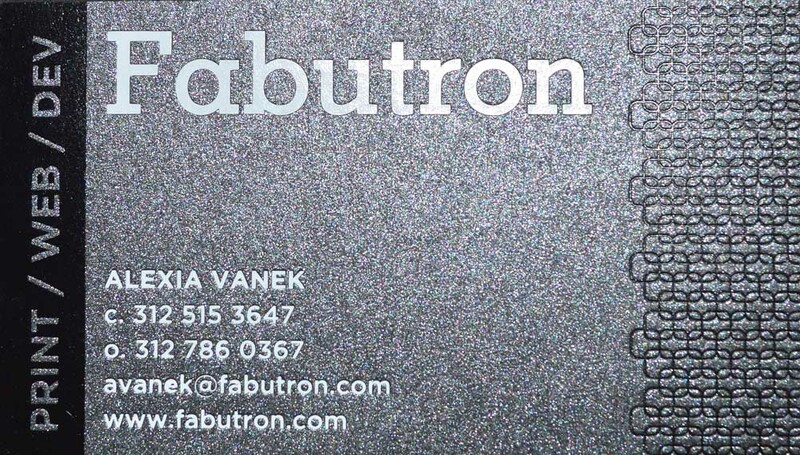 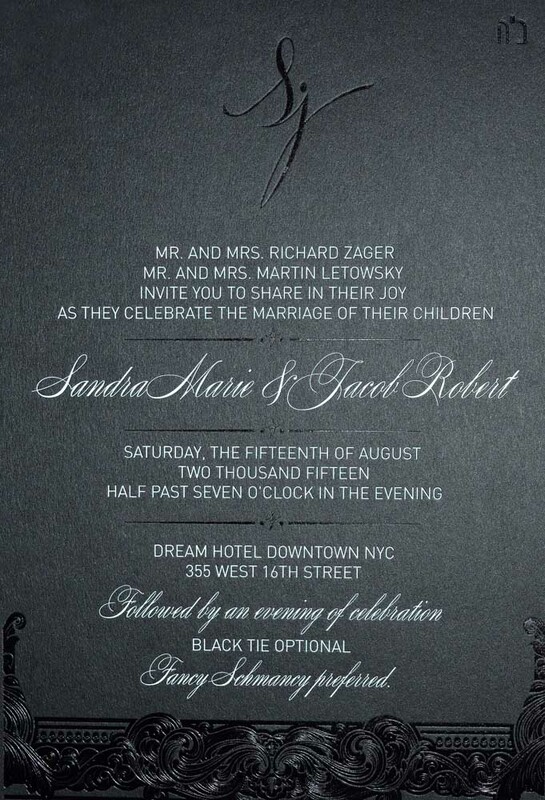 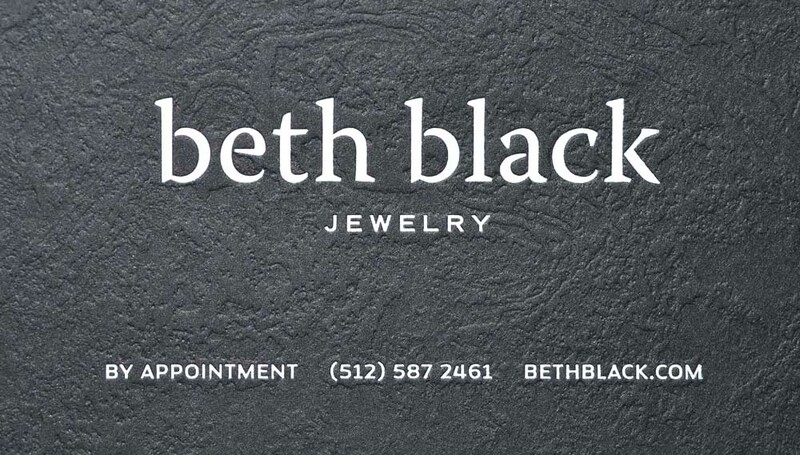 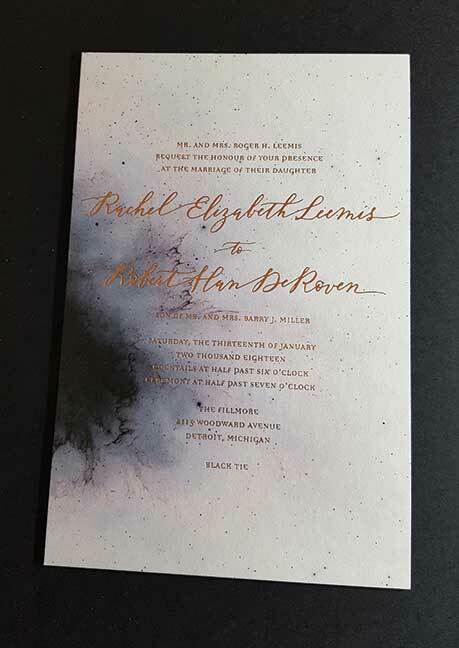 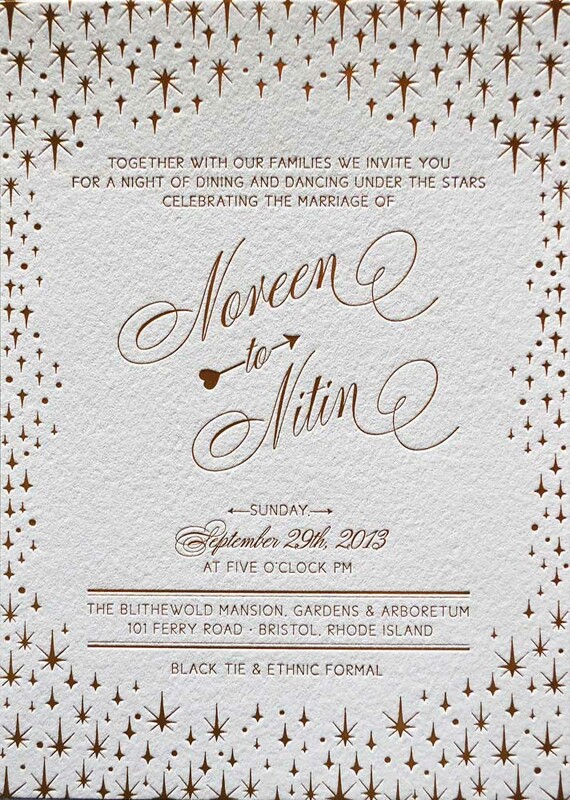 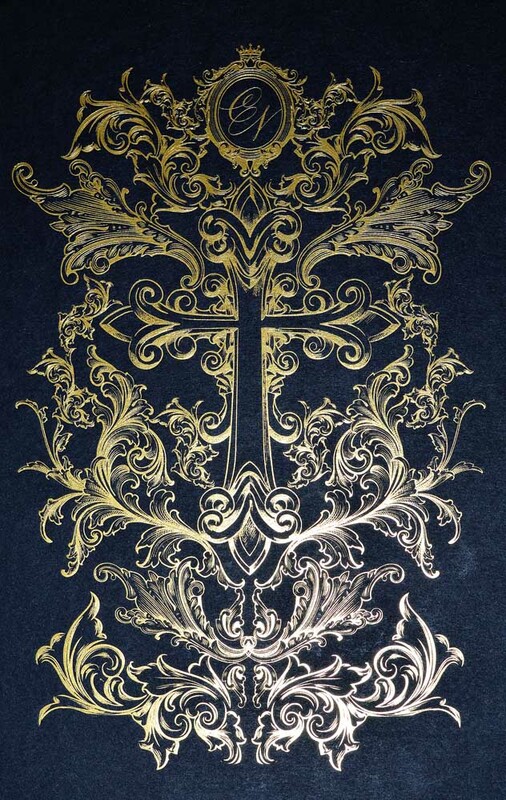 We frequently use white pigment foil on black paper, as one example. 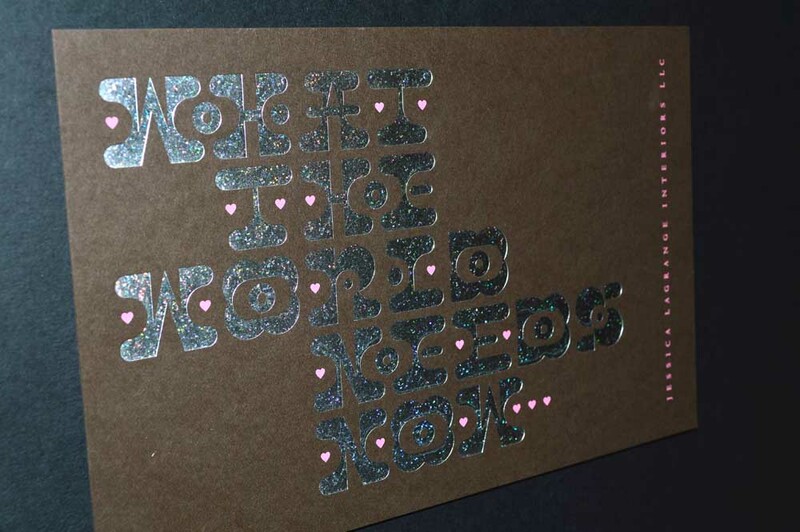 Exceptions to the opacity statement are non-metallic pink and red foils. 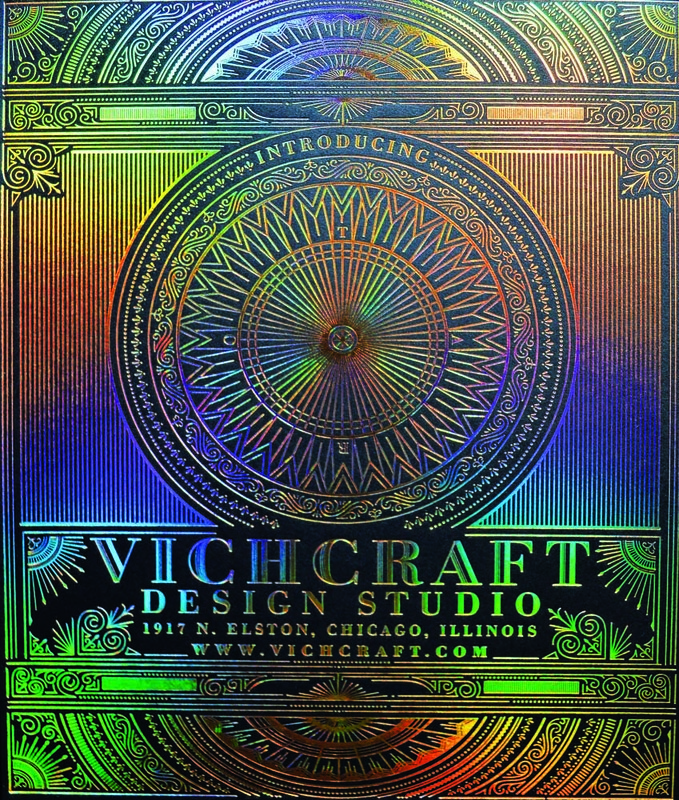 Recent EPA rule changes have caused the elimination of the opacity adding agent that foil manufacturers had been using in these foil colors. 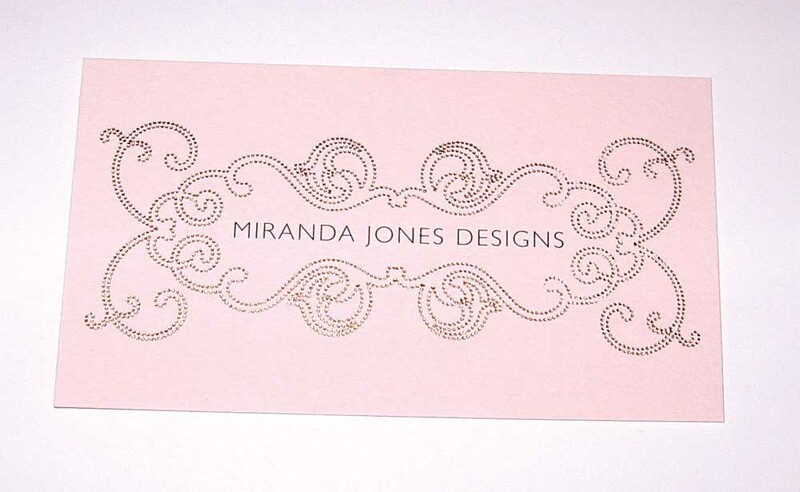 Consequently, pink and many red foils are not opaque. 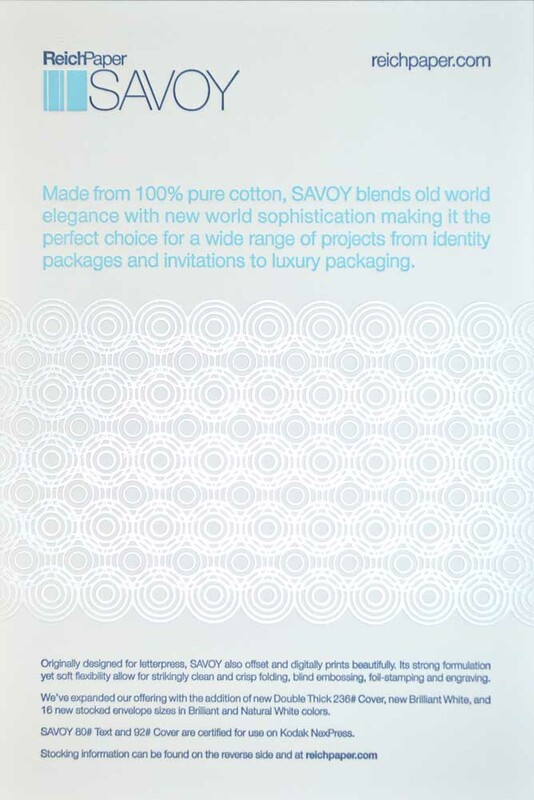 Large areas of solid coverage along with fine copy. 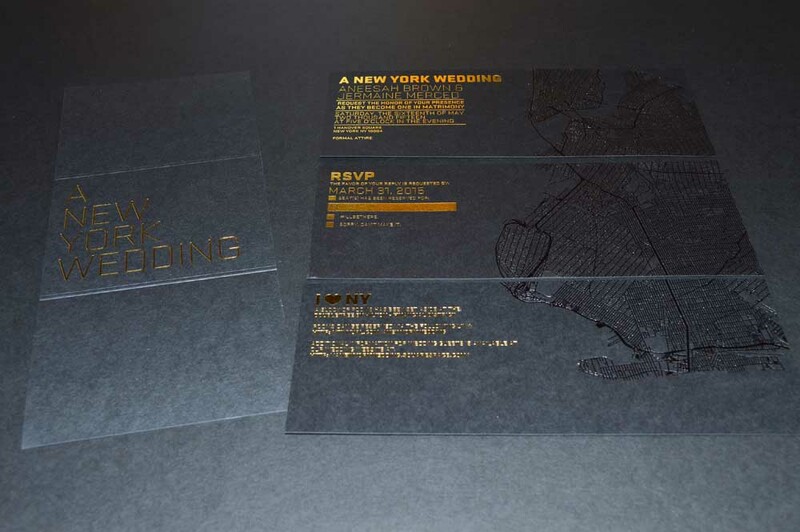 Often two different foil release properties are required for each type of coverage. 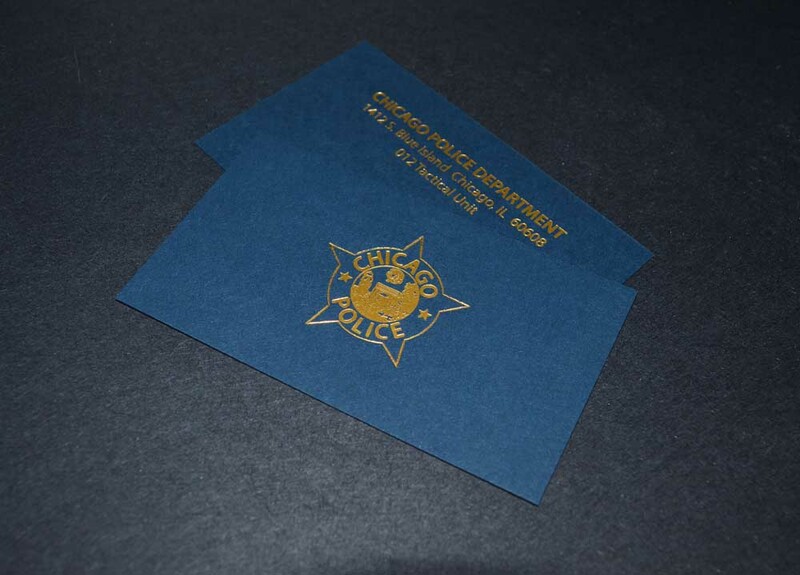 Also solid foil areas with small reversed copy. 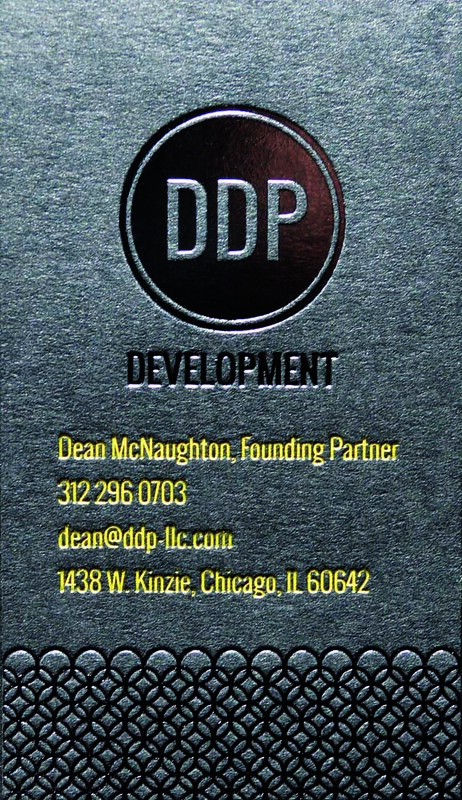 Reverse copy thinner than 3/4 points can fill in with foil. 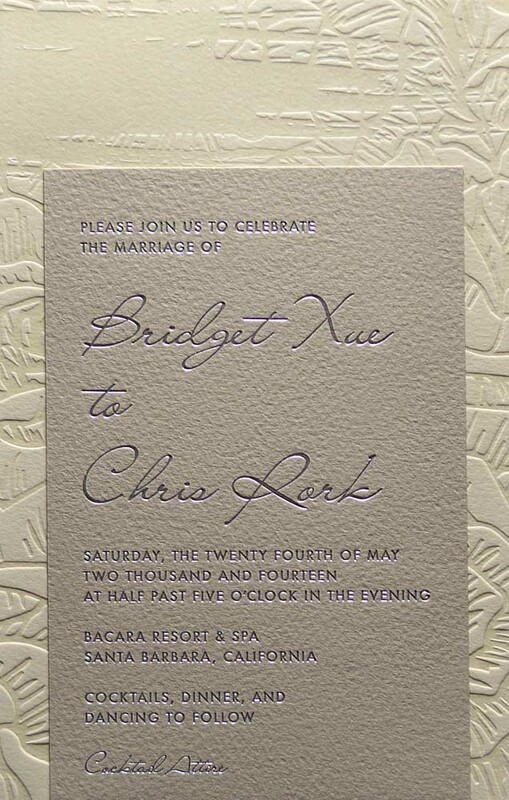 The effect is called “bridging”. 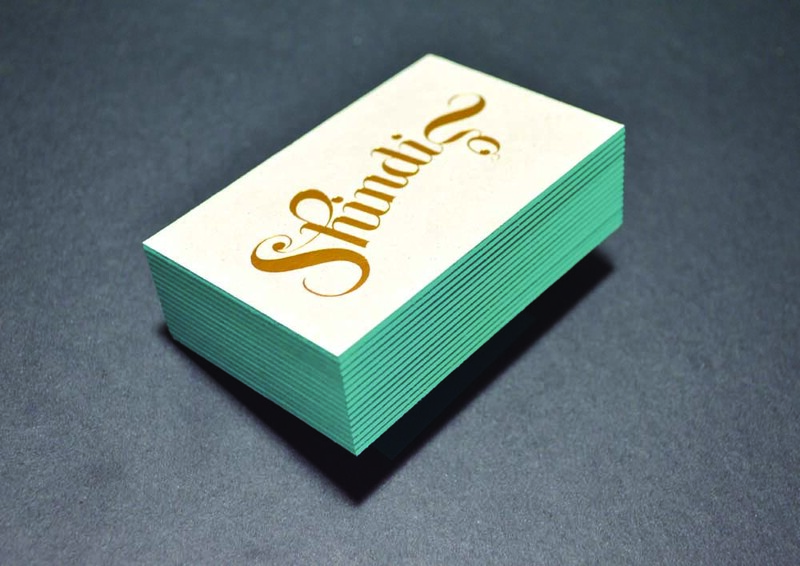 Foils can only print solids (100% values). 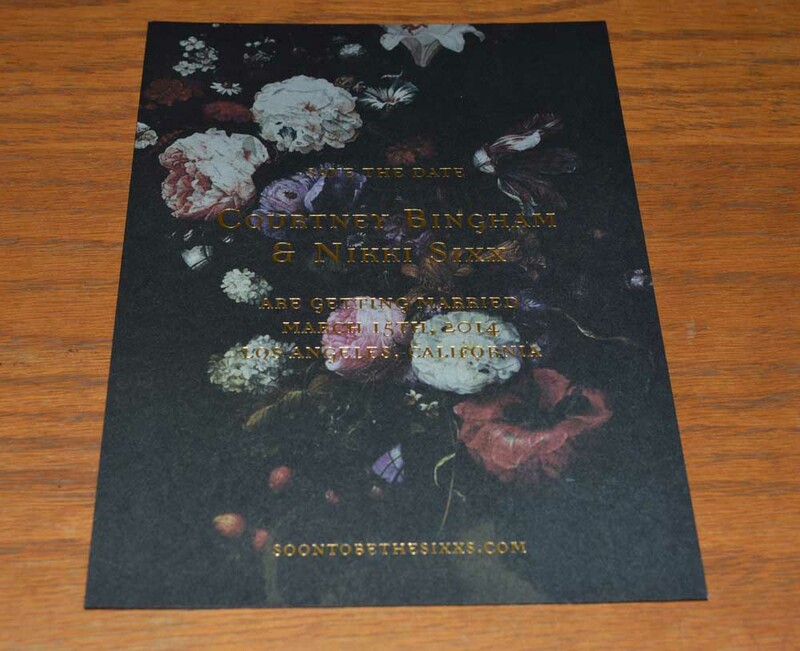 No tints, precentages, photographs or values will work. 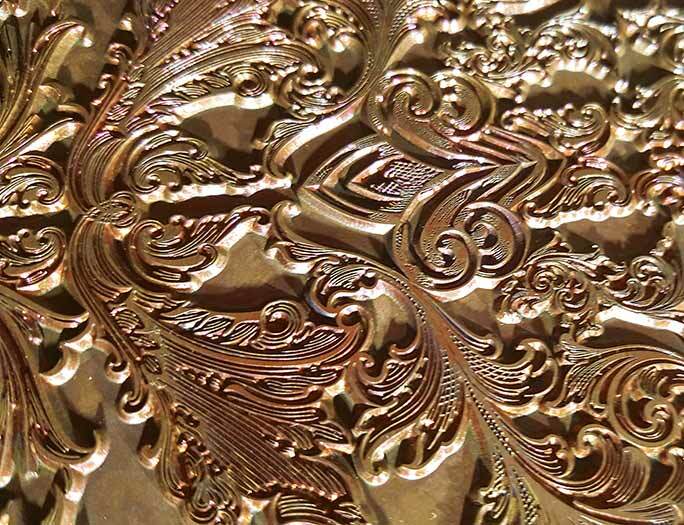 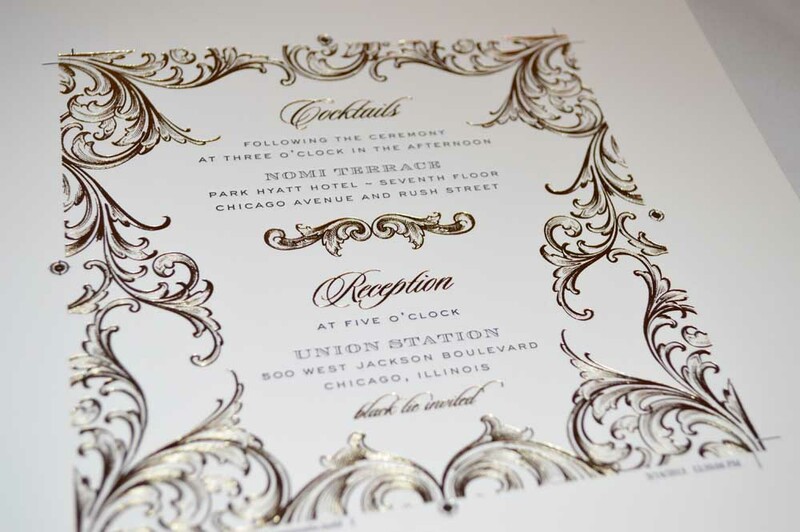 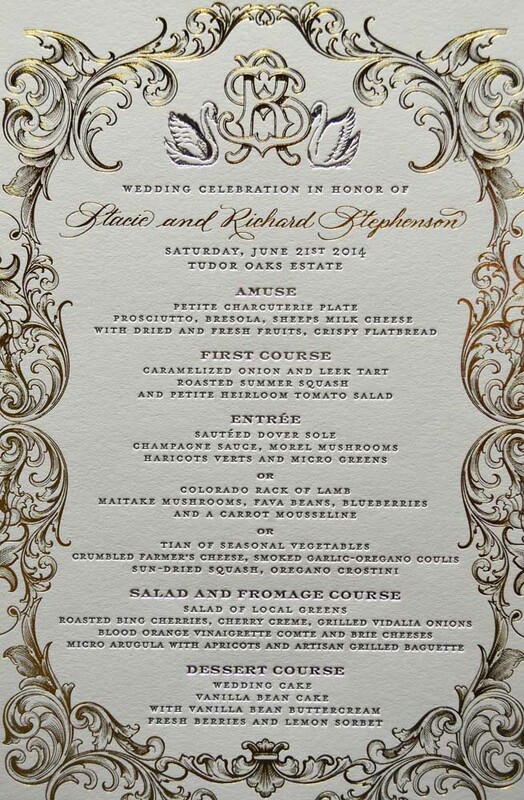 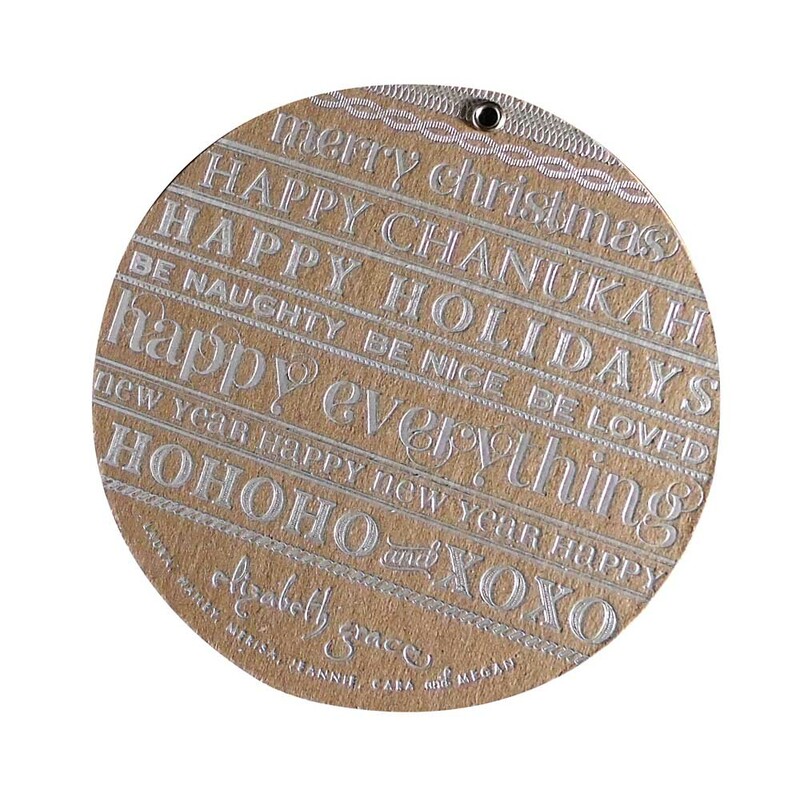 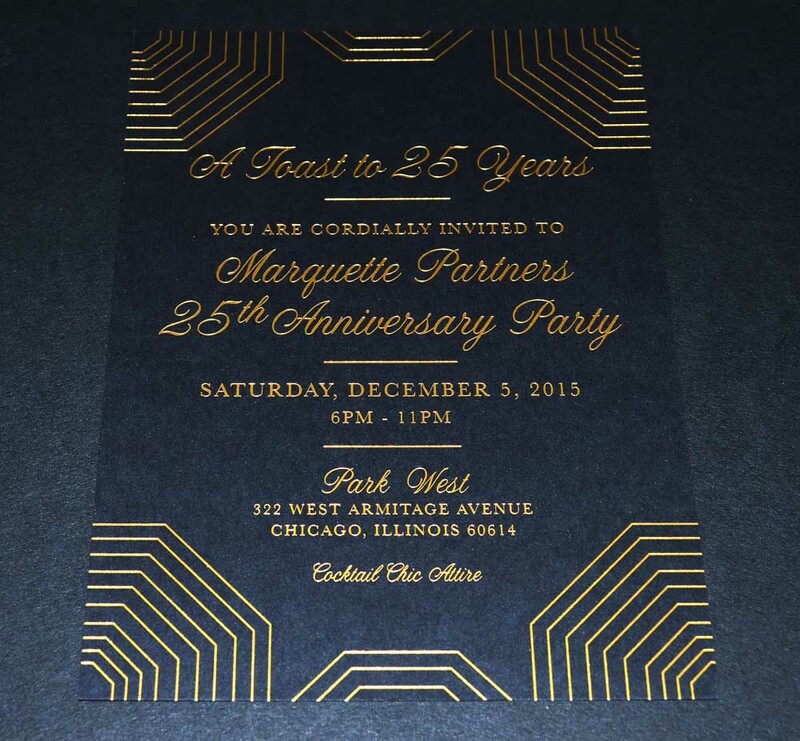 It is exceptionally important to design for foil stamping much differently than for other printing processes. 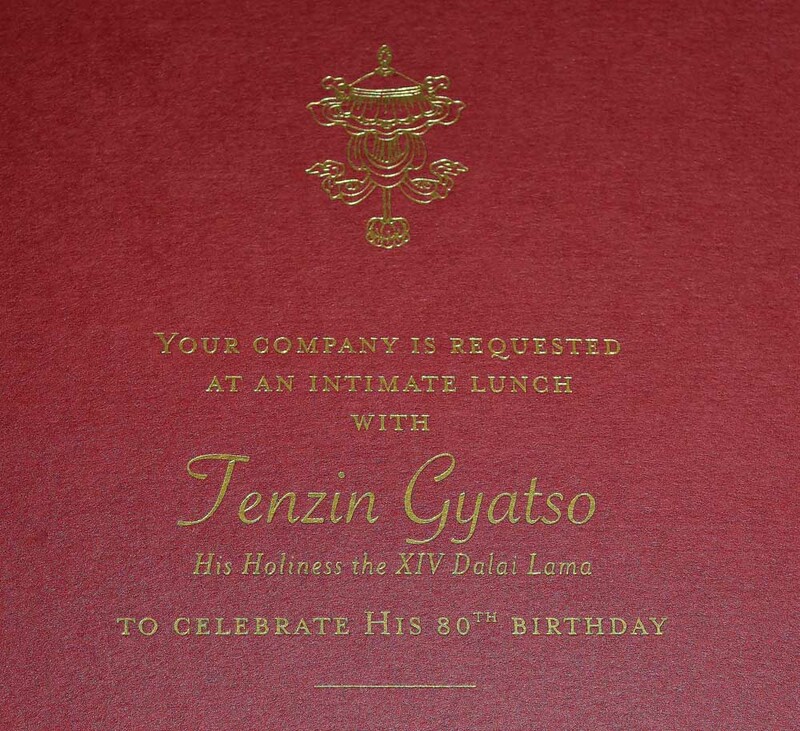 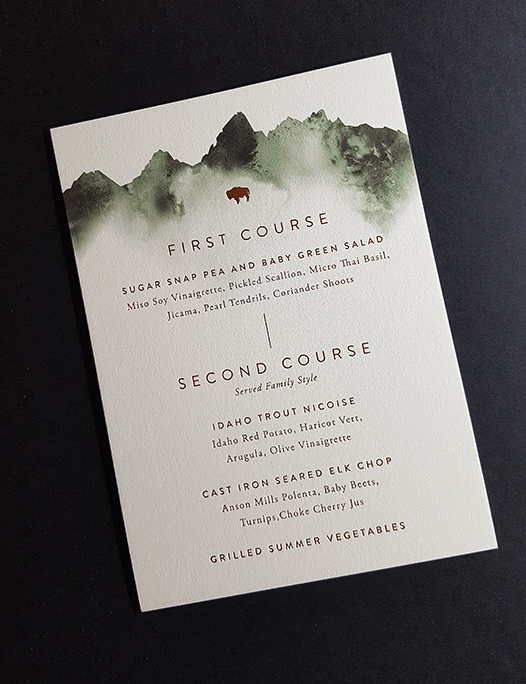 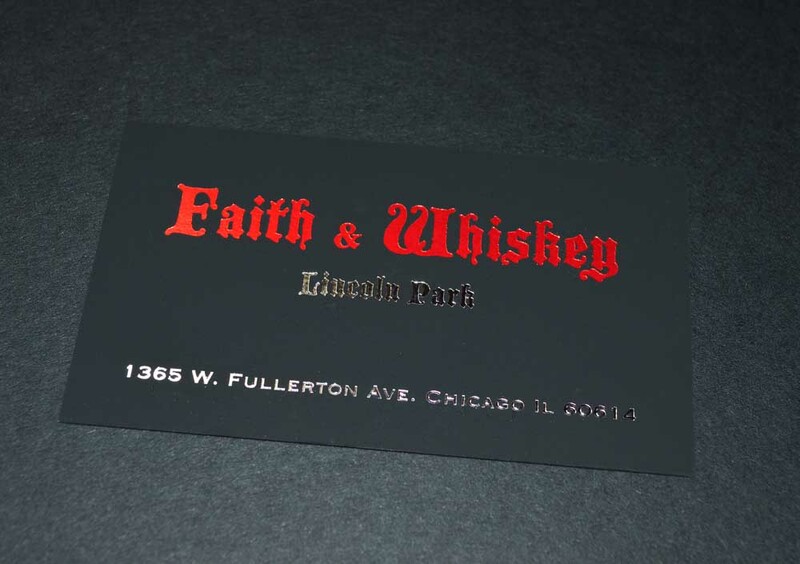 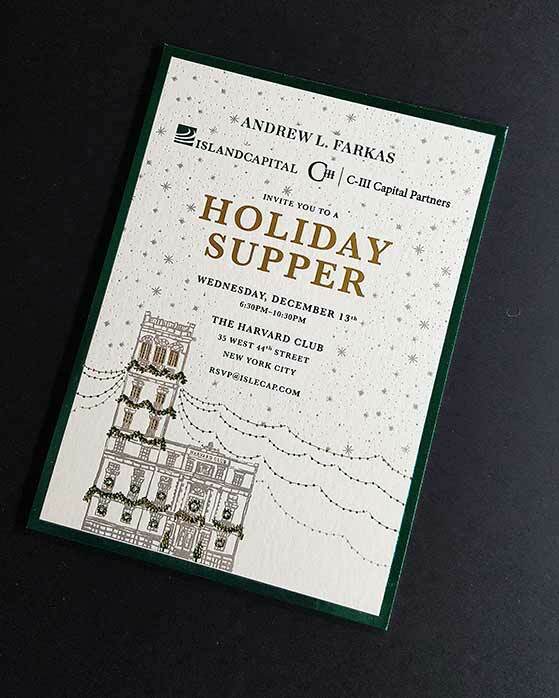 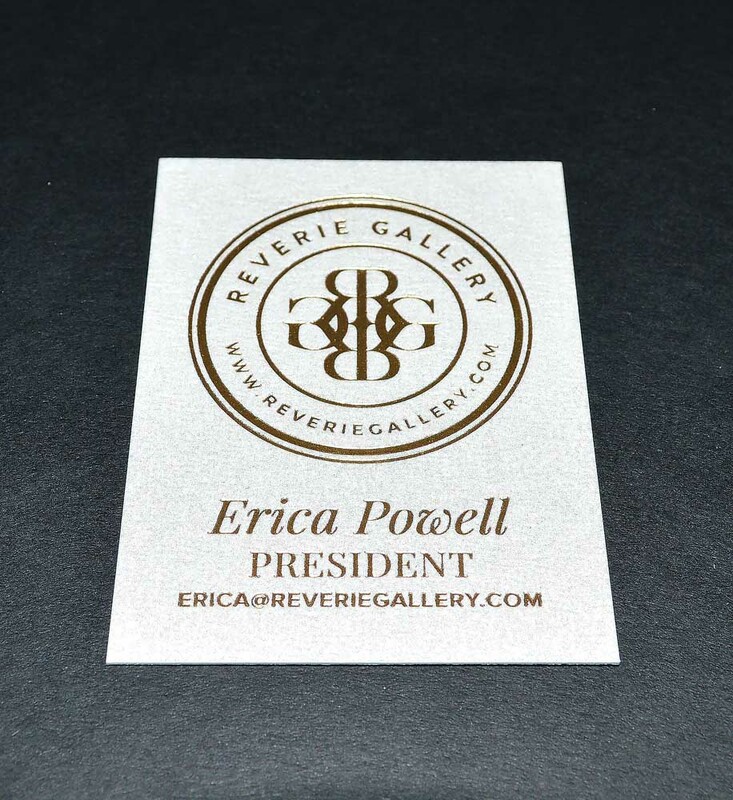 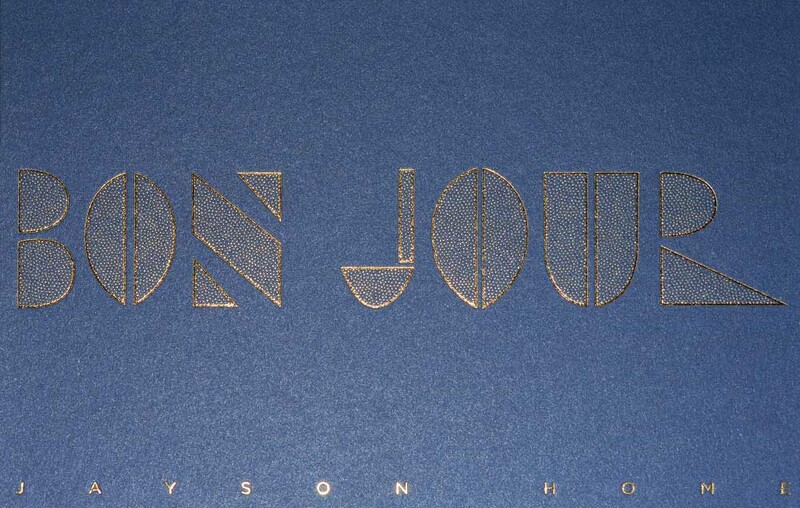 Foil stamping performs best, and yields the most refined looking final printed piece, with the generous use of unprinted paper. 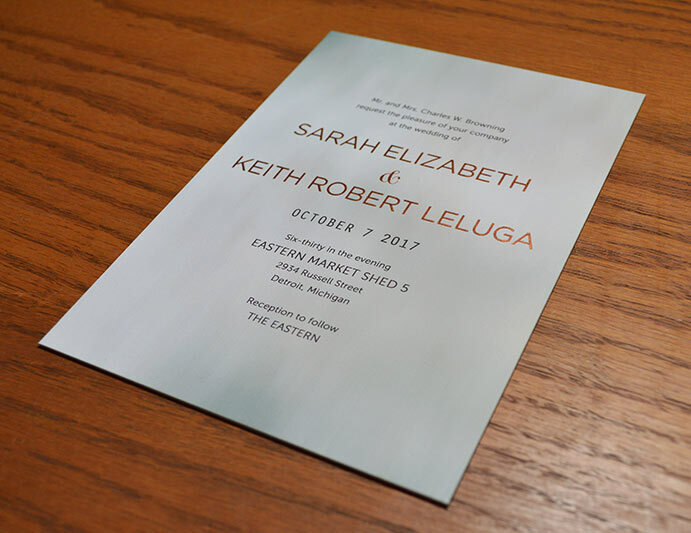 Large fields of solid foil are very difficult to apply. 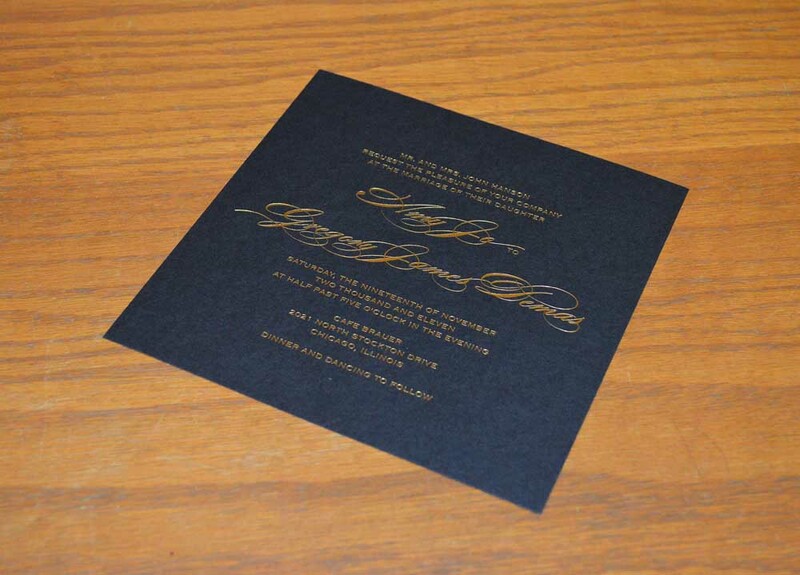 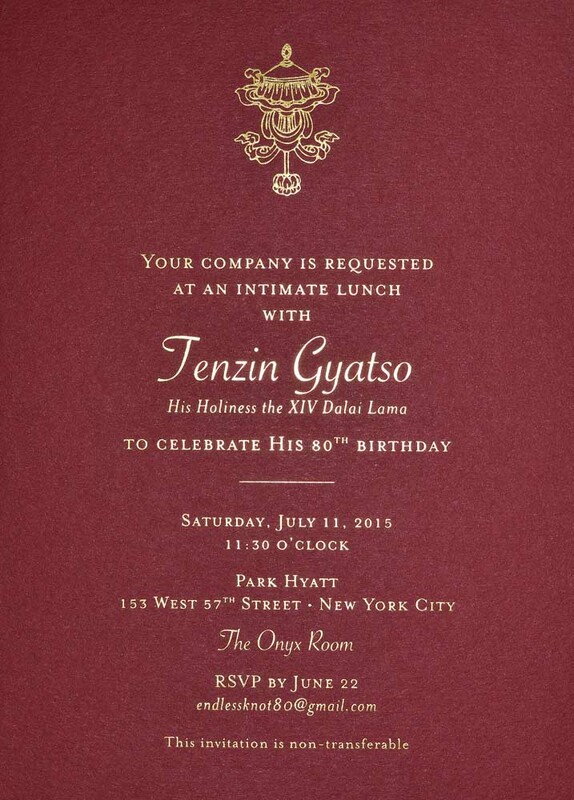 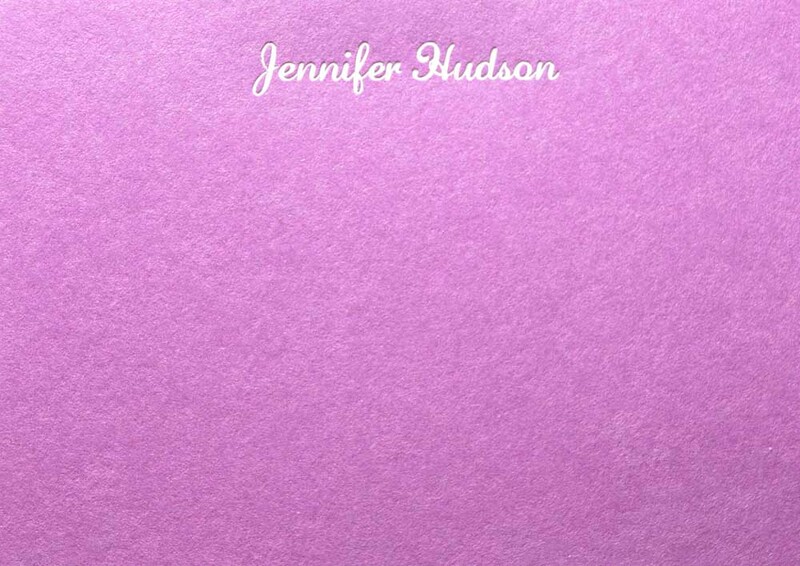 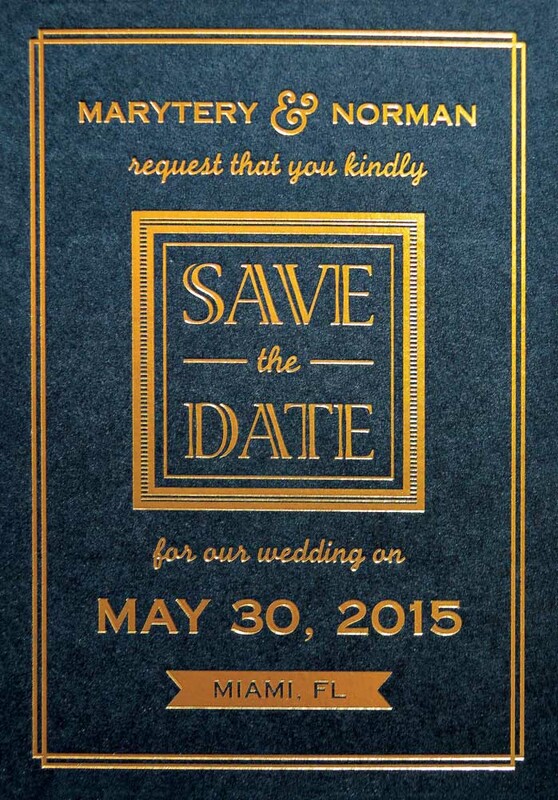 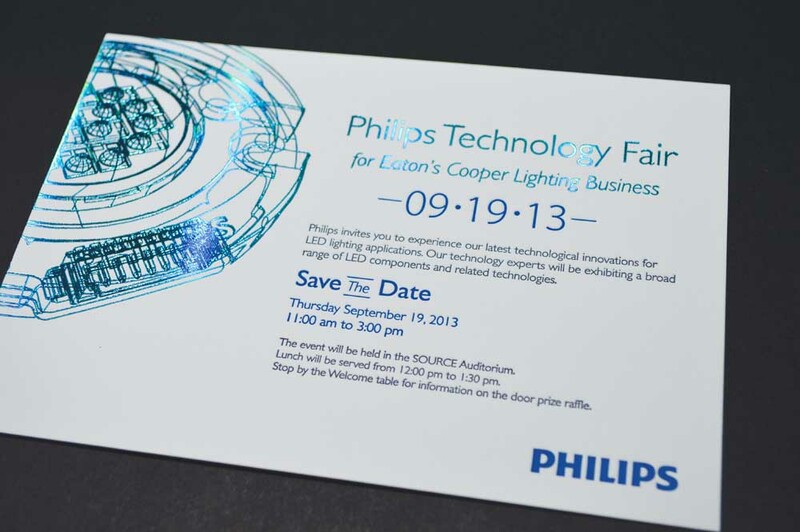 Any tiny piece of paper dust will leave a white fleck, causing this press sheet to be rejected. 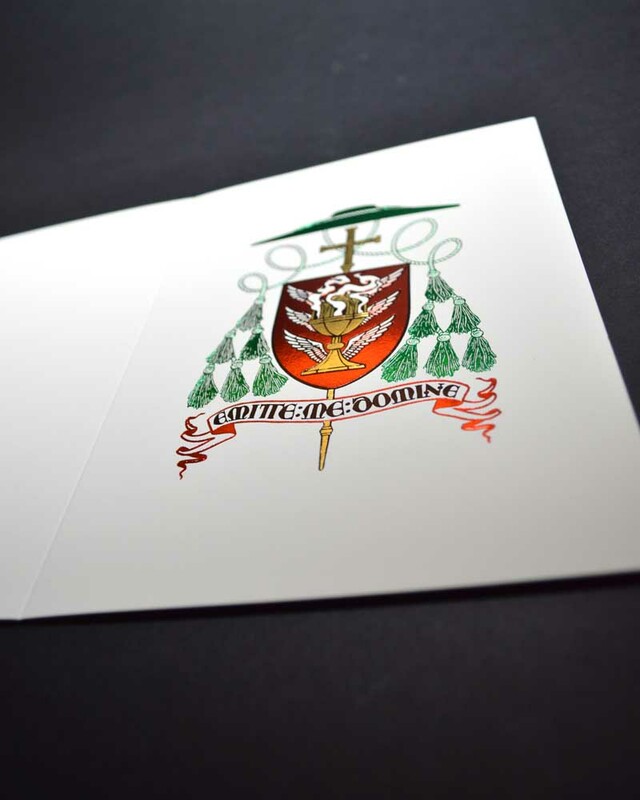 Consequently, your cost will greatly increase with this treatment. 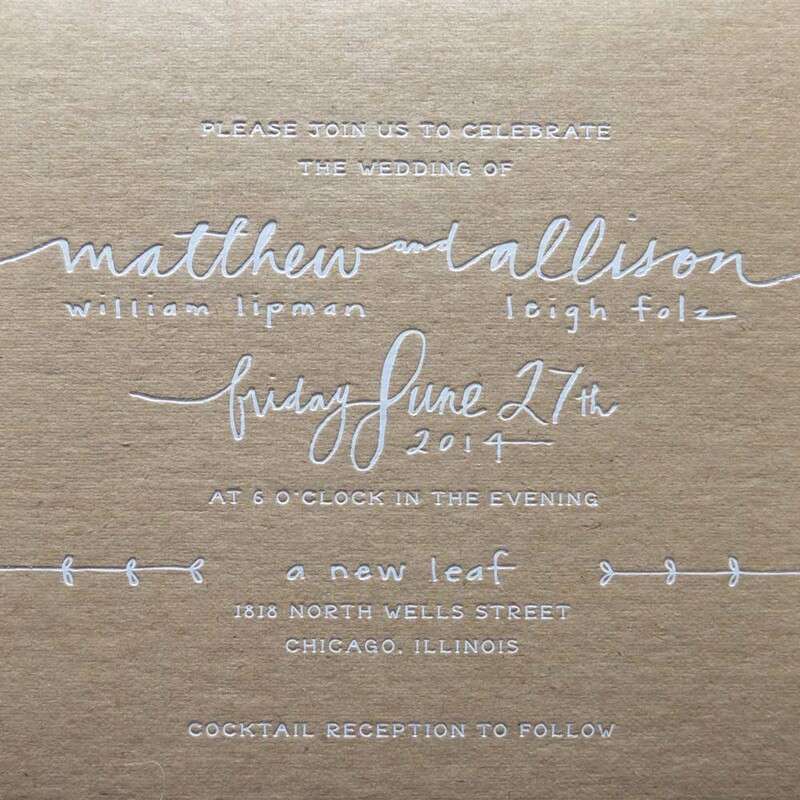 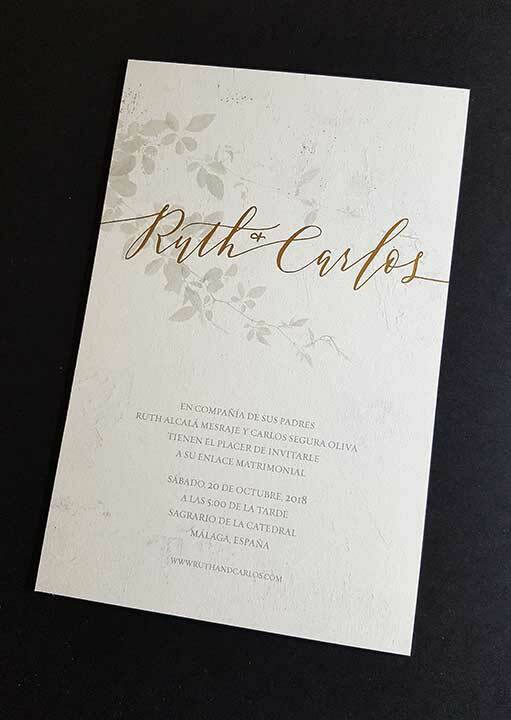 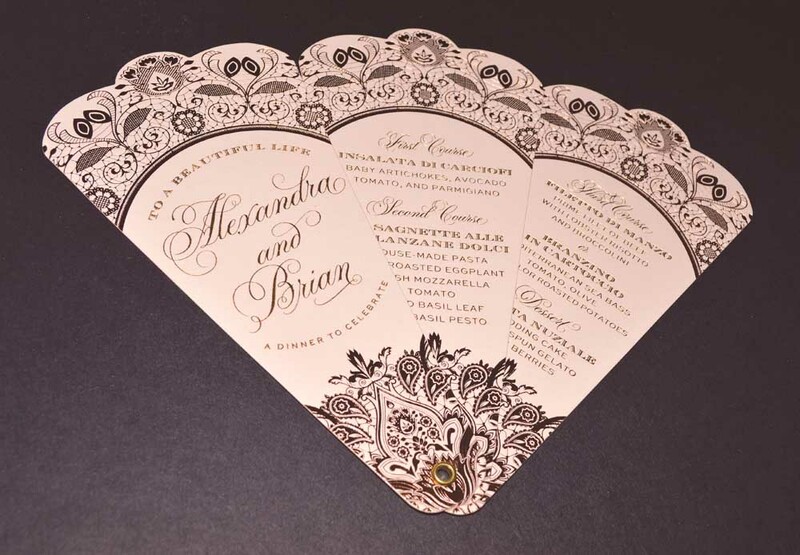 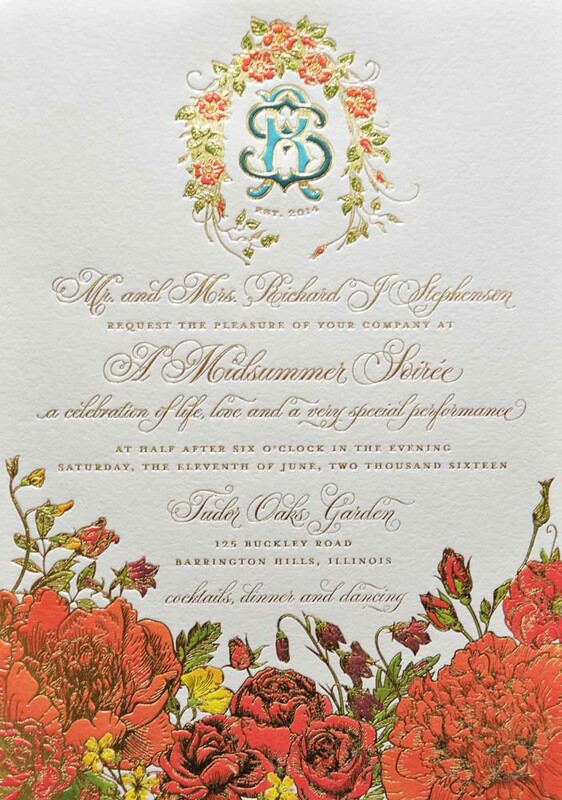 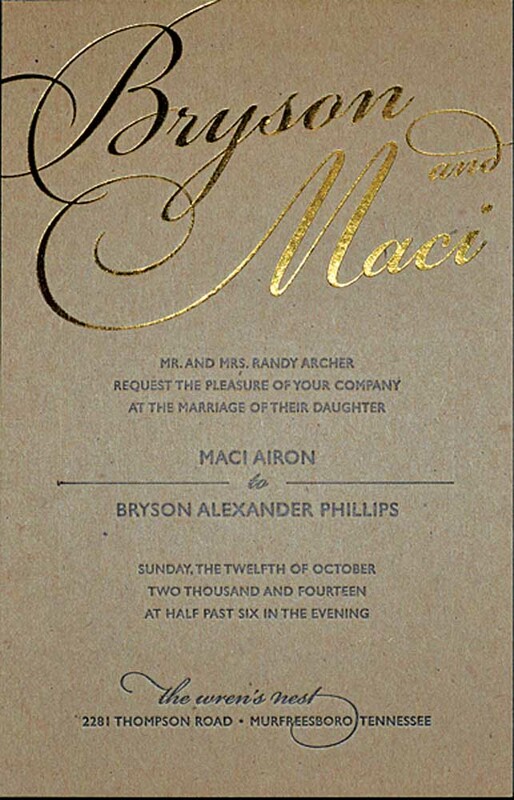 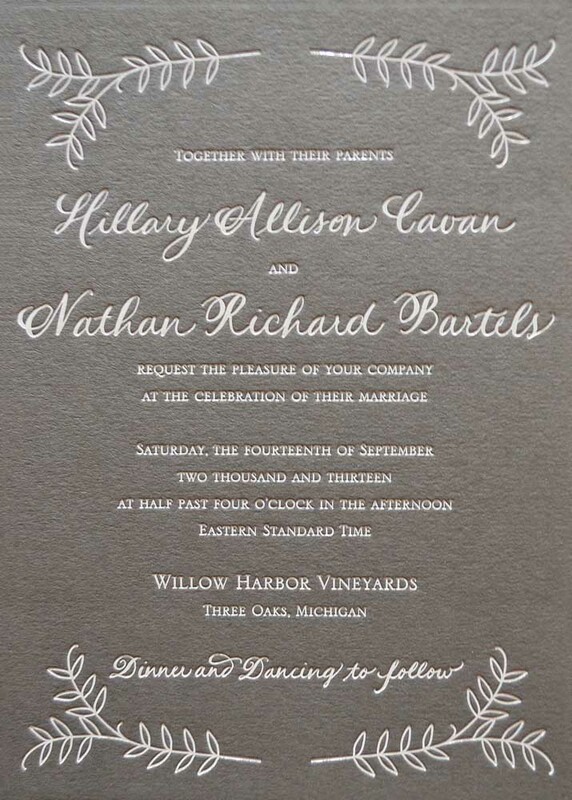 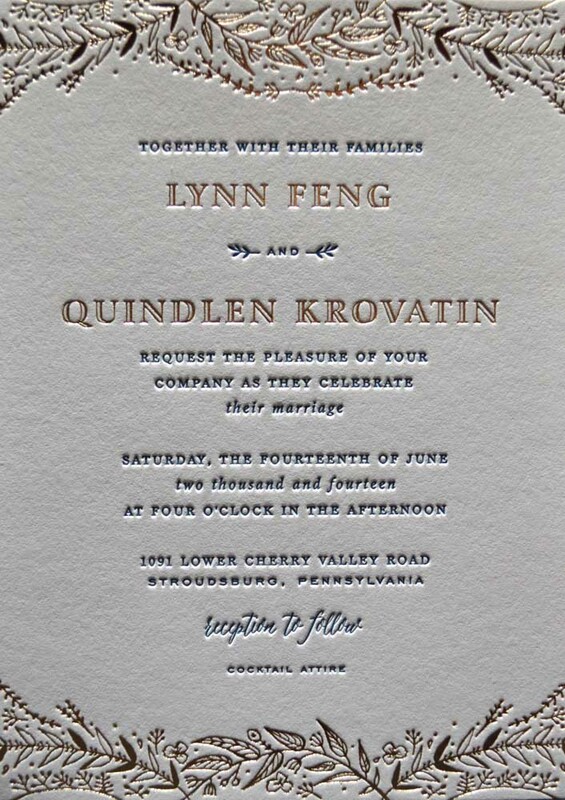 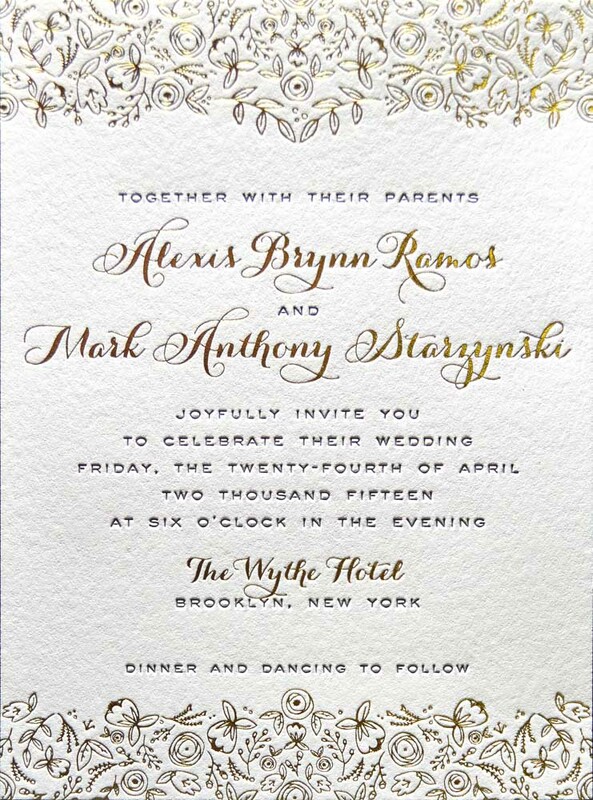 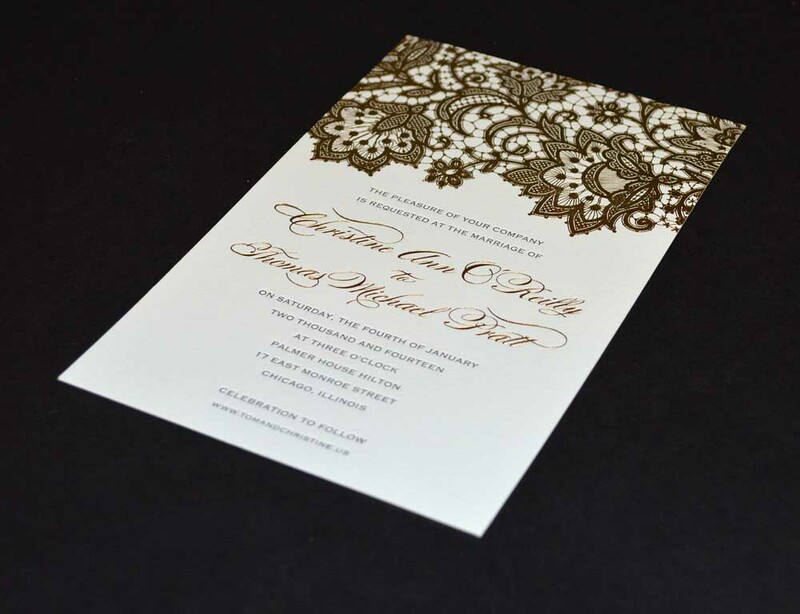 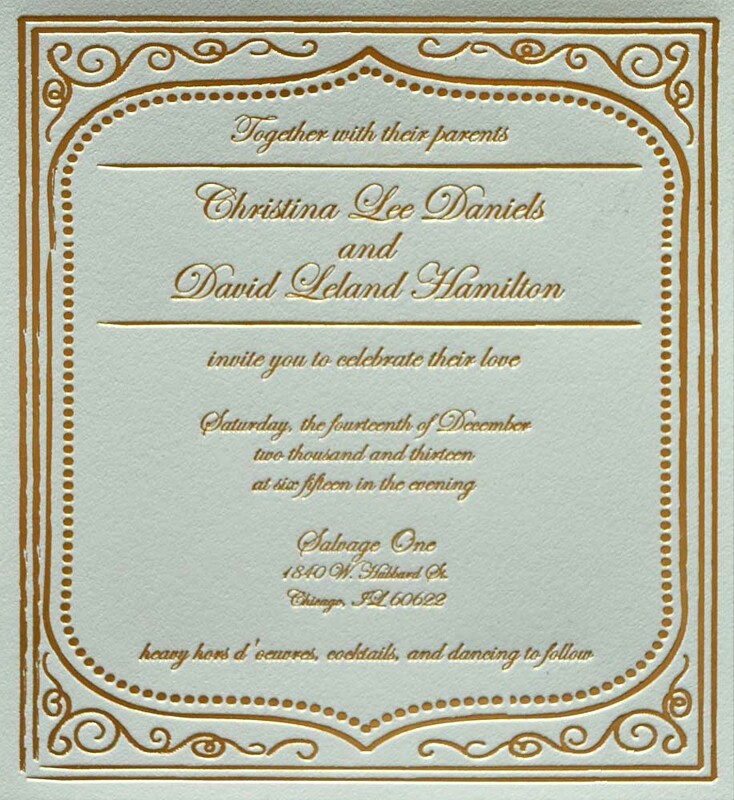 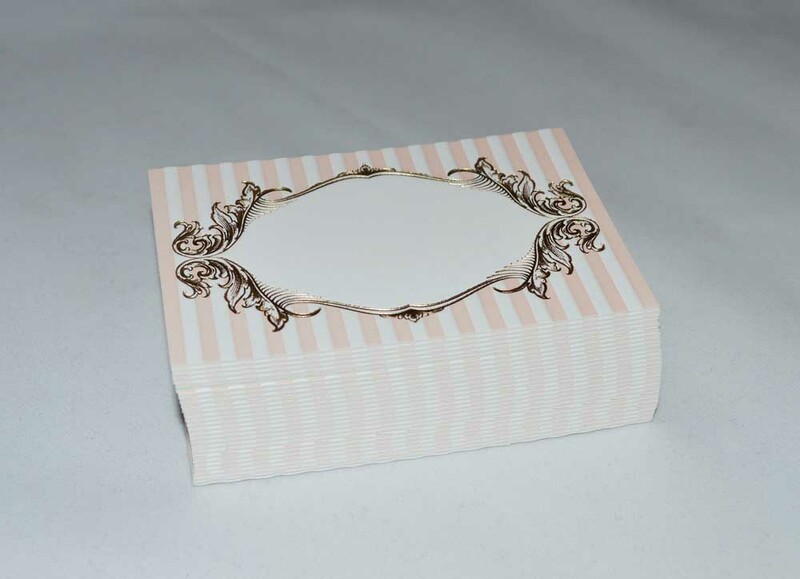 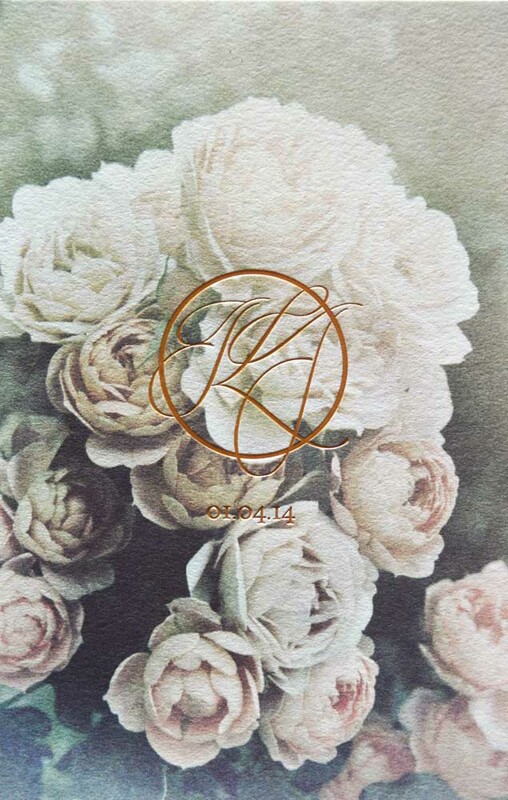 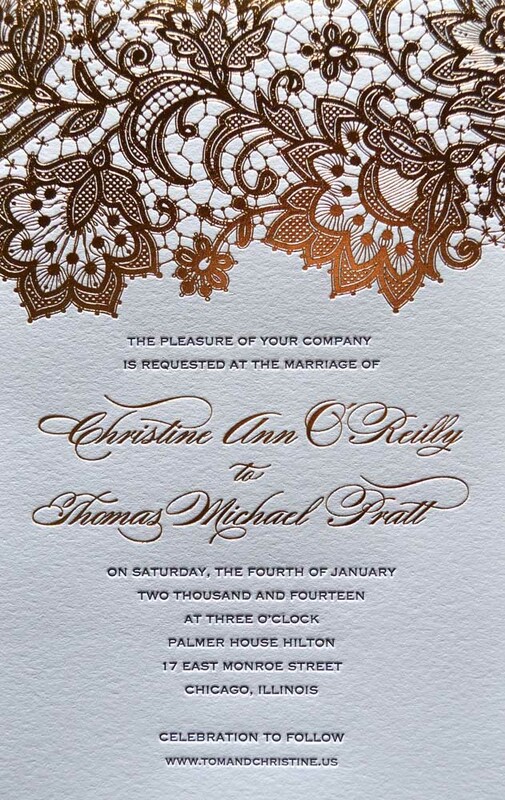 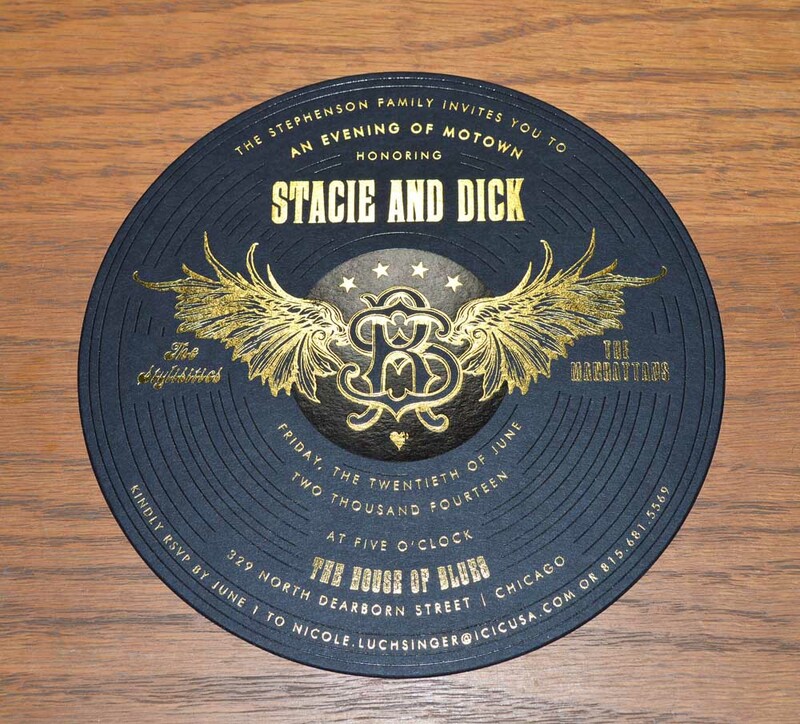 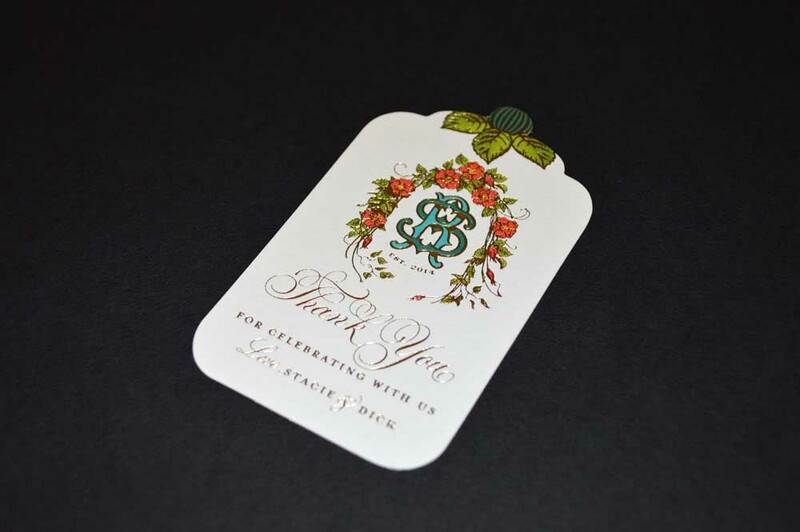 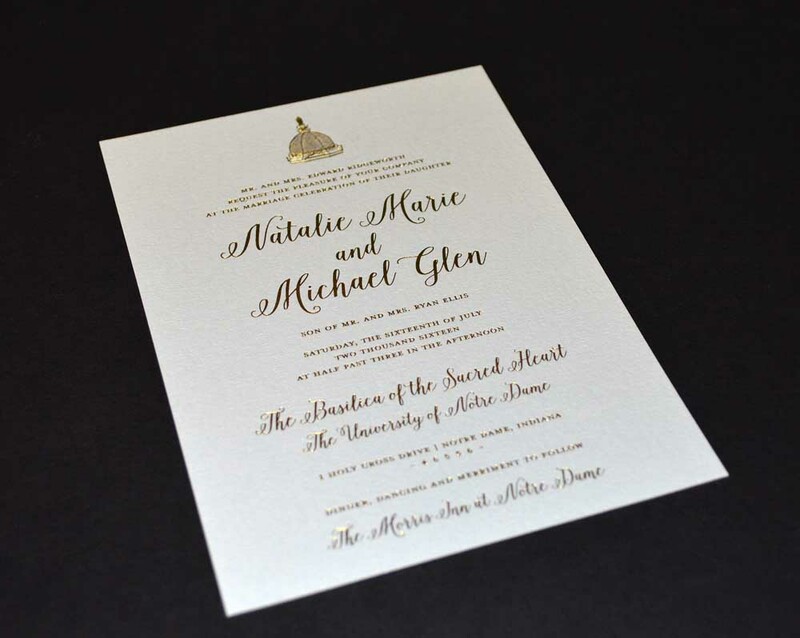 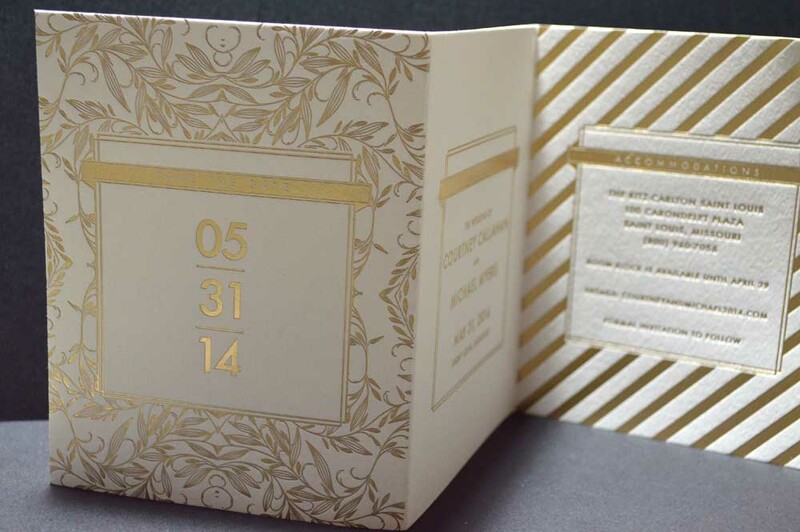 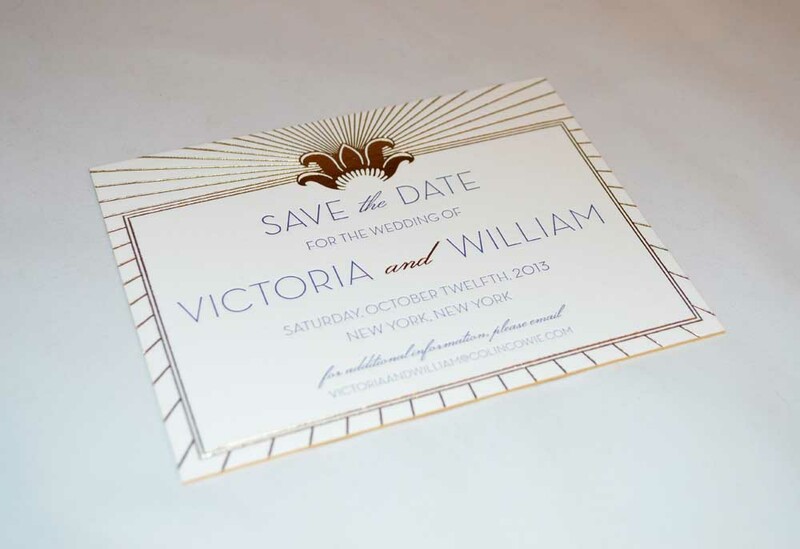 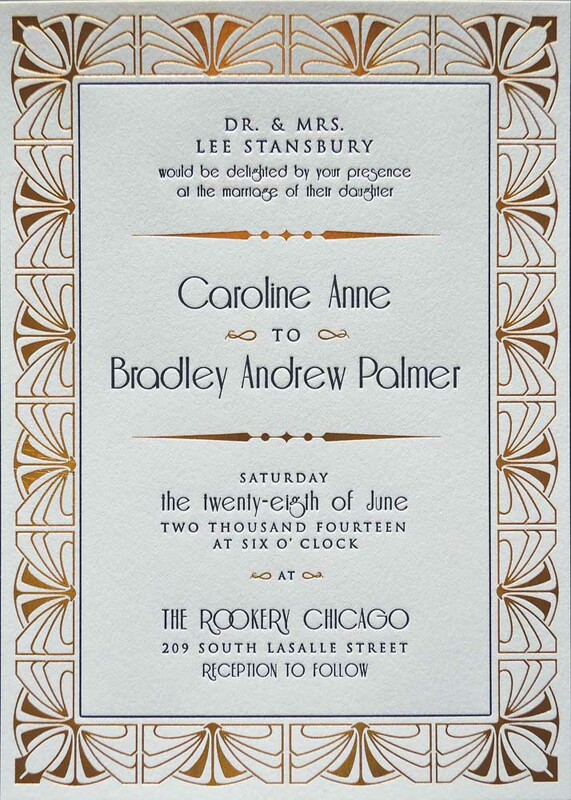 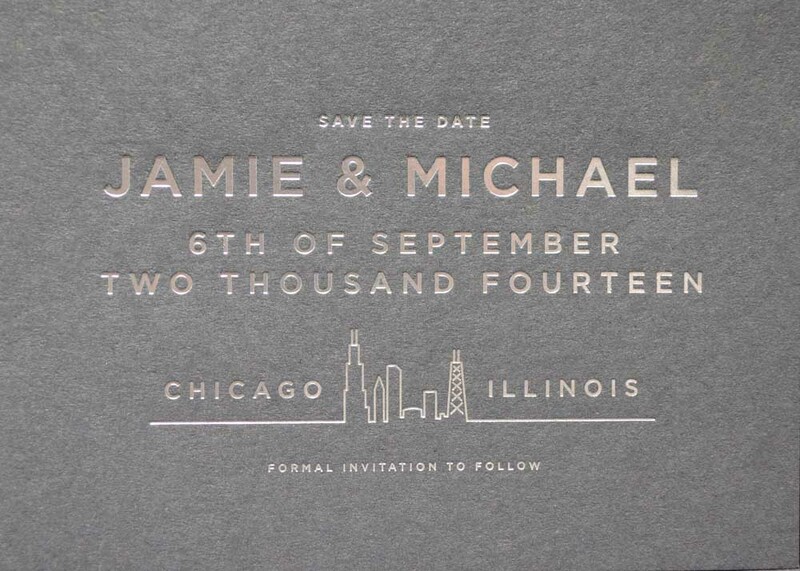 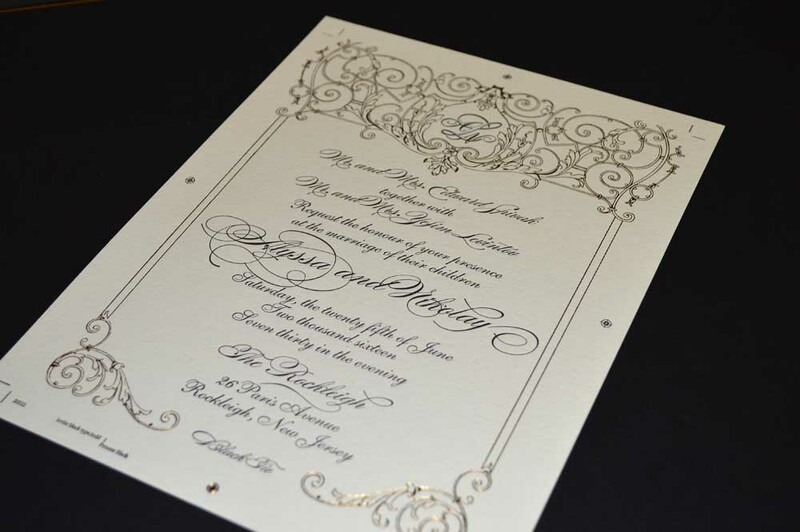 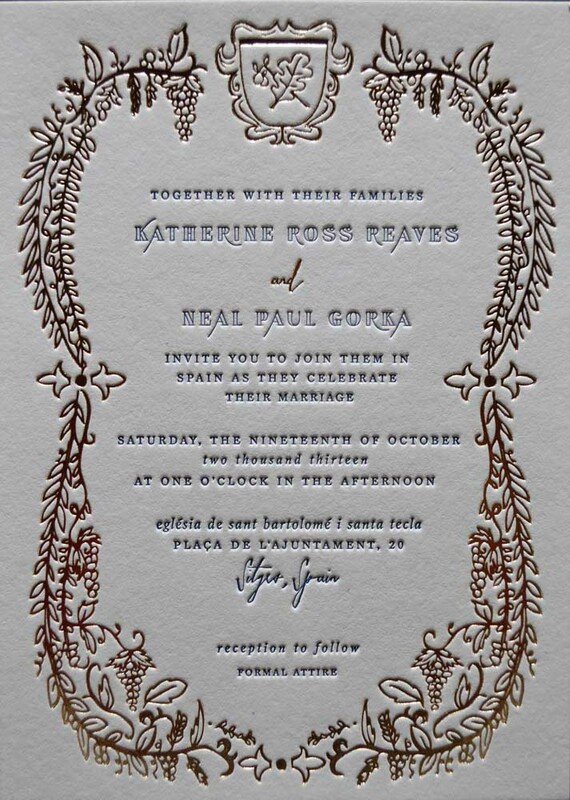 The most frequently produced items are: foil stamped wedding invitations, foil stamped business cards, foil stamped stationery, foil stamped invitations and foil stamped cards.